As we mentioned last week, we finally ditched our crummy Blackberry and got our first iPhone. It was a no-brainer decision. We wanted the convenience of syncing the phone with iTunes and charging it on the two iPod speaker docks we already own. We also feel like Android hasn’t quite pulled even with iOS in terms of development, and we prefer the one-design iPhone over picking and choosing among phones running Android. So getting an iPhone required no thought at all. What required an incredibly large amount of comparison shopping was the case we were going to put it in. An iPhone is an iPhone is an iPhone. They are all exactly the same. What makes your phone yours comes down to two things: the apps and data you load into it and the case you wrap around it. We look at it not just as protection for the phone, but as a fashion accessory as well. Not just that, but it’s an important accessory. 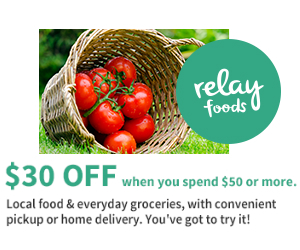 We usually break out our wallet 3-4 times a day, so it’s pretty important to have a nice one. We take out our phone about 59,000 times a day, so the case around it is the most important accessory there is. It has to go with everything from leather to linen and tuxedos to tighty whities. 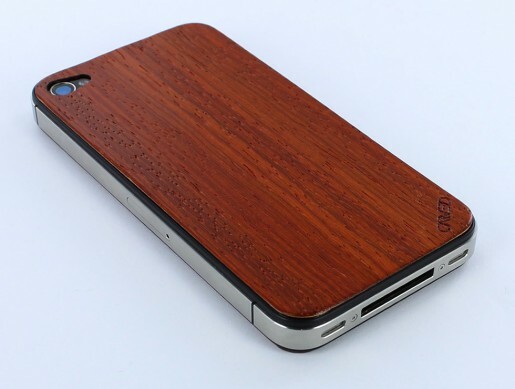 This is the padauk skin that's currently wrapped around our iPhone. Buying a $40 hunk of cheap Chinese plastic to slide around the phone from the rack at Best Buy was absolutely out of the question for us, so we took to the internet in our search for the perfect iPhone protector. But it’s easier to shop for some things online than others. Googling a simple term like “iPhone 4 case” can lead you down a rabbit hole that will take weeks to burrow out of and result in you being served iPhone related ads for months. There are literally hundreds of thousands of choices. Long story short: we ended up at carved.com. 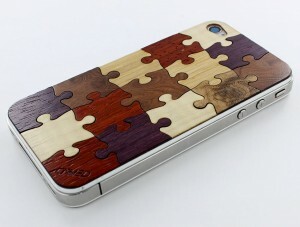 Jigsaw skins are available in random or custom patterns. What’s Carved? It’s two dudes named John and Grant in a wood shop in Elkhart, Indiana. 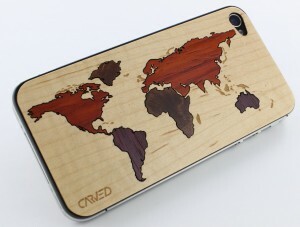 It’s two dudes with a remarkable design sense and a laser cutting and engraving machine who turn blocks of natural and sustainable hardwoods into beautifully unique veneers for iPhones, iPads, Kindles and Kindle Fires. After taking a good long look at the 10 wood choices and myriad design options we decided a Carved skin was a better choice for us over all the other options out there. The world map features sycamore oceans and inlaid continents. After about a week of use, we’re still amazed that they seem to have chosen the perfect thickness for the Carved skin. We’ve found it thick enough to provide some pretty good protection for the front and back surfaces but thin enough not to add substantial bulk to the phone. All of the camera and audio ports work just as well as they do on an uncased phone, and since the steel frame is unobstructed there are no issues with the stereo jack/charge-sync port, 3g/wifi reception etc. Our fat fingers can even reach the home button as easily as ever. 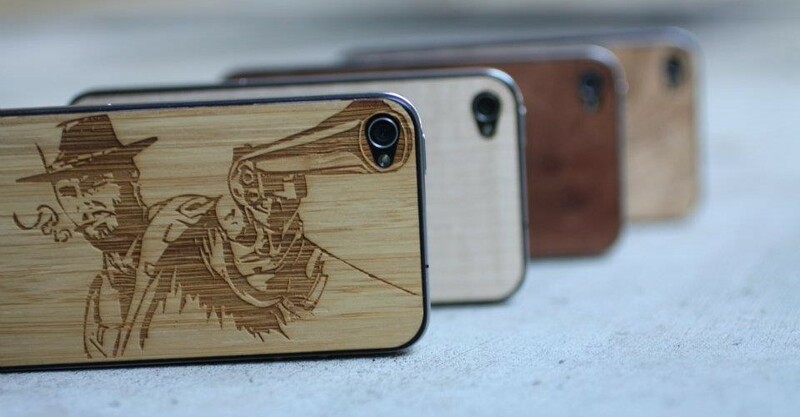 Back panel iPhone skins start at $19, and Carved will throw in the matching front for an extra $5. Fully customized versions with your own artwork, logo, or even something as simple as your name and ‘reward if returned’ are $39… still less expensive than most decent wood options on the market today. We’re loving our padauk skin from Carved, and enjoy taking the compliments it garners on a daily basis. We’d absolutely recommend this product as Chop Approved. We want to thank John and Grant for providing a complimentary product for review. 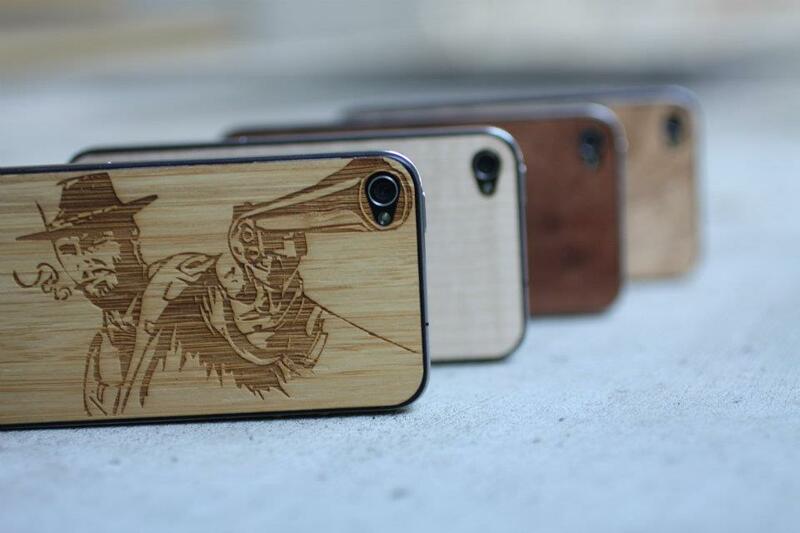 Get yours at carved.com. This entry was posted in Accessories and tagged Accessories, American Made, Baltimore, Carved, Carved.com, cases, design, Fashion, iphone, iPhone 4, Made in USA, Maryland, product review, protection, Review, skins, Small Business, startup, Style, veneers, wood, wooden. Bookmark the permalink.